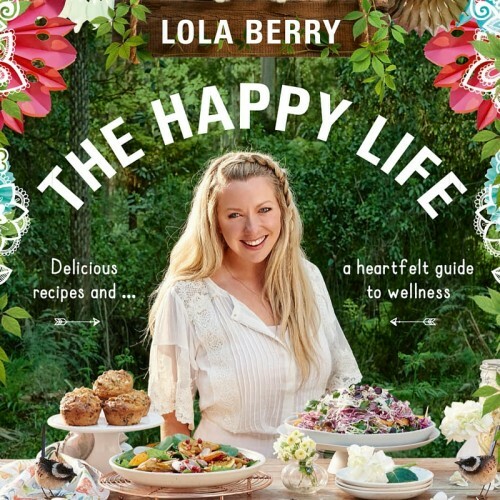 Lola Berry is the goddess of nutrition who has published 6 cookbooks, is a self confessed yoga addict and an all round humble radiant human! We got the low down on her newest book “The Happy Life” and picked her brain on living.. well.. a happy life! Your new book The Happy Life focuses on holistic wellness and the link to leading a happy life. Do you believe we are in charge of our own happiness? I think we are and it takes a massive choice to choose to put yourself first, that said of course there are mental conditions which many people have need to be taken seriously. But I think choosing to put yourself and your health first is a massive choice and it takes courage. You say in The Happy Life that you used to be ‘the queen of excuses’ for not making a lifestyle change. What was the turning point for you? The moment I decided to do things for me because I valued myself! And can I be honest, I think we have many turning points in life. But the ones we make from our hearts and for pure reasons are the moments that really make a change. You talk in your book of mindful eating. Can you explain mindful eating and how important this is? It’s really about being present in that moment, noticing the smells, textures, who you’re sharing your meal with. We tend to eat on auto pilot, I know I’m guilty of eating while I check my emails, but it’s really about coming back to that moment, being grateful for your awesome meal and honouring the food and the fact you’re choosing to nourish yourself. We believe at The Divine Company that it’s important to know what is going into and on your body. Your principal of eating ‘real’ food goes hand in hand with this. Can you tell us what you consider ‘real’ foods? Well put simply I think real food makes you feel great (so think whole foods) and junk food or heavily processed food makes us feel like trash. The body knows what to do with real whole foods like fruit, veggies, nuts, seeds, protein (I like to go for ethical whenever I can), that’s food that can nourish you and give you sustained energy. If you go into a supermarket and pick up something in a packet and it reads more like year 12 chemistry class, full of long words and numbers, put it back down, there’s a good chance that food may well outlive you. 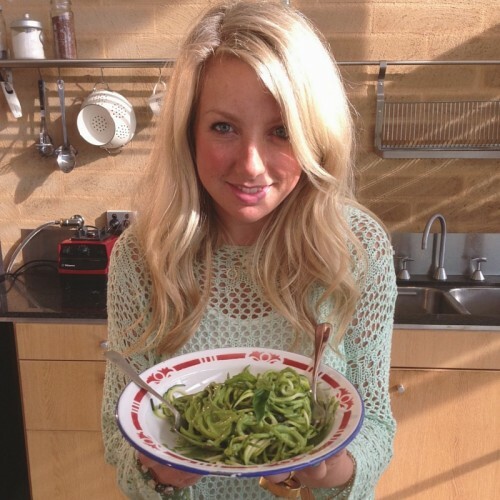 You mention in The Happy Life that happy eating is not about “rigid rules, crazy detoxes and obsessing about food”. What damage do those restrictive diets and detoxes do to your body? I think any kind of hard-core restriction (unless it’s a diagnosed allergy like coeliac disease and gluten) can be an unhappy way to live. I’m not saying go out there and eat junk food, but what I am saying is that life is here to be lived, so go out and live, if that means you have a few awesome experiences that involve you trying a new ice-cream or watching movie eating chocolate and popcorn, then I think in moderation (not every day) then your body will be able to find balance. That said, these days there’s so many healthy alternatives to your favourite “naughty” foods that you can feel like you’re indulging without even indulging. In The Happy Life you talk about the importance of detoxing your life, choosing skin, hair and beauty products which are as close to nature as possible. Was this an easy change for you to make and how has it impacted your health? I think for me it was more about the real people, I know I was letting a lot of people stay around me that might not have had the best intentions. So letting the fake ones go and keeping just a small handful of real friends is key, they’re the ones who will have your back when things aren’t so great, the fake ones will run a mile. I don’t need to have a zillion mates in the world, I just want real souls who can see me for who I am not what I do. That’s made a huge change to my life and the energy around me. The Happy Life is a holistic approach to wellness, where you talk about how important it is to nurture your soul through spirituality and mindfulness. How do practice this on a daily basis? For me I find this in nature, I think mother nature has a way of spiritually grounding us and she really brings us to the present moment. Meditation, which to be honest I can get a bit slack with but when I’m on point with it I feel clear and focused mental, emotionally and calm spiritually. Then yoges is a big one for me, it’s the gift I give myself and when I teach it’s a gift I share with others. You mention in the book that you have never skipped breakfast and how important it is to start the day with a good breakfast. A lot of people struggle to find the time in the morning to make breakfast for themselves. What is your favourite breakfast on the run? Now that’s a hard question, I’d have to say smoothies and at the moment I’m loving “the golden goodness” it’s banana, mango, macadamia nuts, nutmeg, cinnamon, coconut milk and dates – so good!! There are so many delicious recipes in The Happy Life! What are your three favourites? The beanie brownies, having the beans in it give it the smoothest texture. The green shakshuka because I can make that for brekkie, lunch or dinner! The ginger bread porridge is pretty special too! There’s too many to want to talk about! If you want more of Lola, you can find her on Instagram @yummololaberry or www.lolaberry.com. The Divine Company stands behind her new book “The Happy Life” filled with nothing but pure goodness ranging from wholesome recipes and heartfelt wellness advice!